Are you confused about the best time to call, how long you should wait to call the first time after meeting? Or perhaps you wonder how long to stay on the phone, if you should send a text or not, send an email or not, and when and how often to do any of the above? 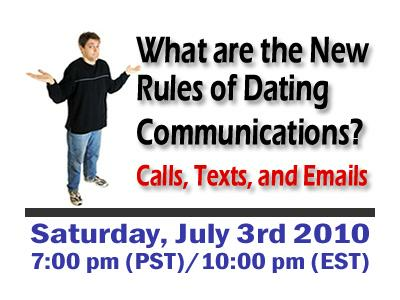 Singles everywhere want to know the rules and guidelines for modern communication when dating so they don't mess things up! Tonight we'll discuss the "do's" and "don'ts" of using technology to create increased romance and closeness. Call 347-327-9215 to participate in the show live, or log onto http://www.blogtalkradio.com/askheartbeat to chat and follow along on your computer.